better than i could have imagined: Painted Toes. 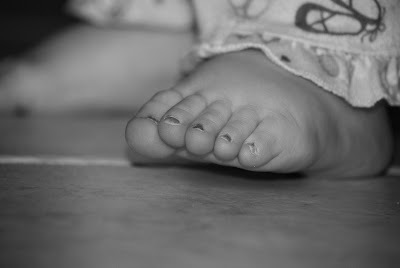 I have been meaning to get around to painting my toes for the past few weeks....but with school....being a wife...school....being a mom.....and- did I mention school?......painting my toes tends to fall at the bottom of the list. I know it doesn't take long...so maybe I'm just lazy....that is a very real possibility! But anyway- a few days ago I did sit down and take off the old nail polish from the pedi I got at the Gaylord when we went to the spa for Geoff's birthday back in November....with my plans being to re-paint my toenails in front of Parker. 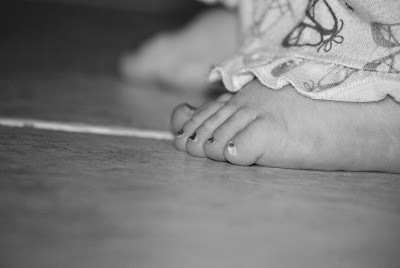 I wanted her to see me do it....and then see how she reacted....then possibly paint her little toes. So this morning...my plan was brought into fruition....and she sat there and watched me paint my toes.....then started putting her foot out in front of me....making noises like "me too!" 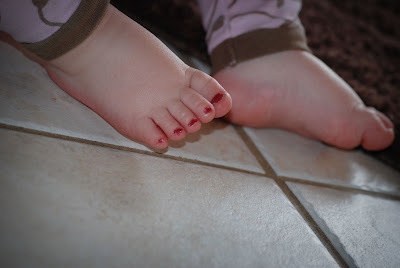 So when I was done with me...I took her socks off and painted her toes for the first time ever!! She was so good to sit there and let me do it....although- it really only took a minute because they are so small....and also- if you look closely (so please don't)....it's really a horrible job. But I didn't want to glop to much on their thinking that she would probably not sit still long enough for it to dry. ...and "miraculously"..... she was fine. 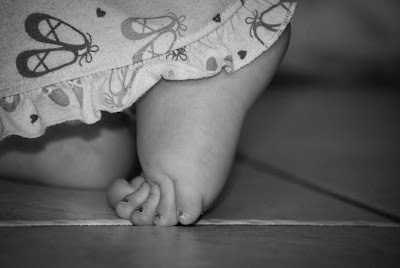 And even now when I say...."let me see your toes"....she looks down at them and smiles and kind of sways her head like she is so proud if them. Little toot! 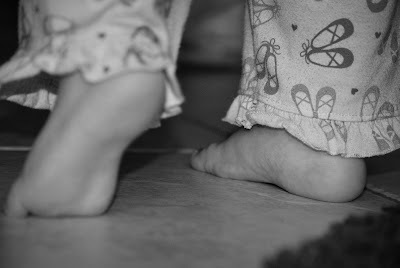 So then I was all into looking at her feet...and before she went to sleep.....as she was watching the last few minutes of Word World...I took these pictures. I just couldn't stop myself! Would you have been able to??? 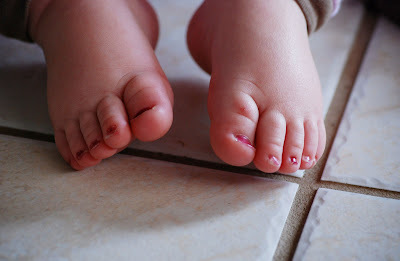 And yes- I do realize that I just had a "photoshoot" with my kid's feet....and then blogged about it. And I'm not ashamed one bit! How sweet! Abbey puts her toes in her mouth (she knows it bothers me, I'm convinced), so polish is out for awhile! 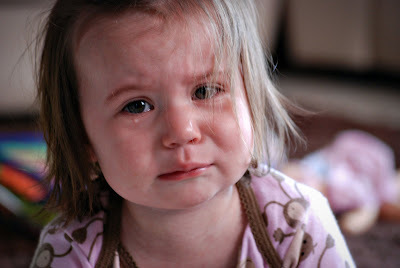 That picture of her crying looks so sad... I know she was fine and not hurting.. she just makes it look that way. That is pretty funny, I am glad you got them painted!! Pig tails, nails painted... what else.. she is a really becoming a little girl! How cute is that! I'm going to have to see her watching this "Word World" one of these days. I agree with all three of these previous comments too! LOVE THOSE FLUFFY FEET too! 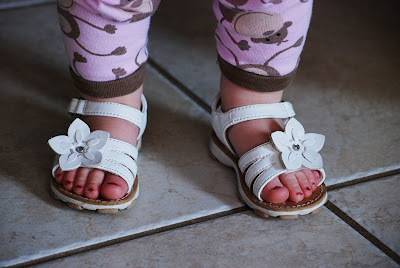 She is so adorable, beautiful and yes - the fluffy feet... makes me want to smooche them! i think my blog is broke. The return of the Look-alike Meter. Spending the summer at the water park!